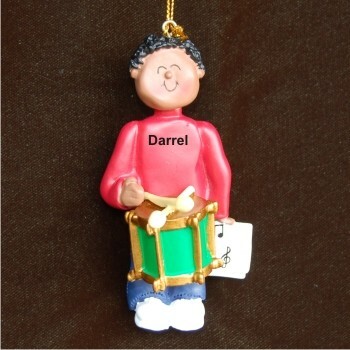 Drummers dig the drums virtuoso African American male personalized Christmas ornament. These are hand lettered musical instrument ornaments personalized with his name and the year too, if you wish. We feature a wide range of musician instruments in this series, so you'll find the instrument you want and the "look" that's right for your favorite player. Let him know you're proud of his success with the male African American drummer Christmas ornament personalized with his name. A display cord is included and the decoration arrives in our custom velvet drawstring bag.